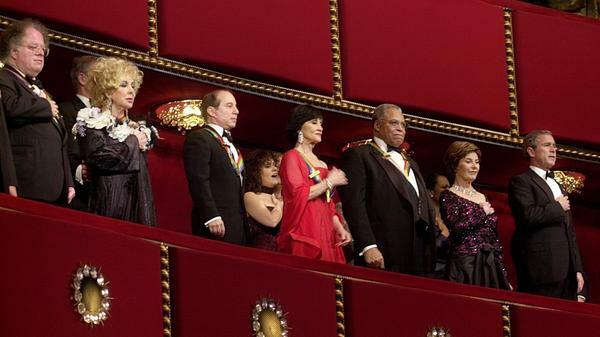 Honorees (from left) James Levine, Elizabeth Taylor, Paul Simon, Chita Rivera and James Earl Jones stand beside first lady Laura Bush and President George W. Bush during the 25th Kennedy Center Honors in 2002. Rivera was the last Hispanic recipient of the award. 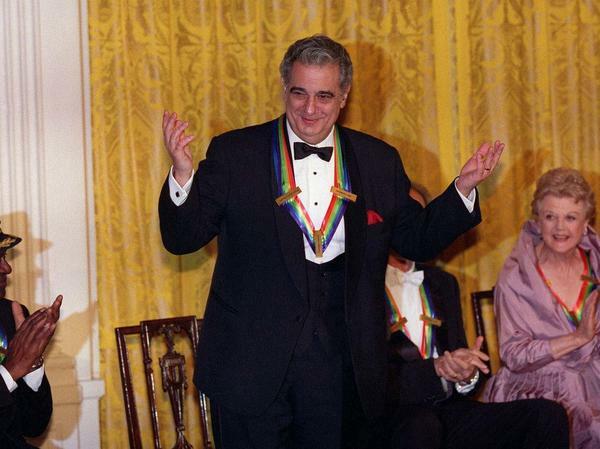 Tenor Placido Domingo was the first Hispanic honoree, receiving the award in 2000. "These awards have turned into a quasi-governmental national awards," says Felix Sanchez, president of the National Hispanic Foundation for the Arts. For two years, Sanchez has been writing letters to Kennedy Center officials asking why — out of a total of 186 artists and entertainers — only two honorees have been Hispanic: Placido Domingo in 2000 and Chita Rivera in 2002. "When you paint that picture and you leave the Latino artist community out of it, there's a huge hole," he says. Sanchez has no trouble identifying deserving Latino artists from over the years: There's Anthony Quinn, Celia Cruz and Desi Arnaz, to name a few. According to the Kennedy Center's website, a national artists committee — including some former honorees — makes recommendations. There are 76 people on that committee; only two are Hispanic. The final honorees are selected by the Kennedy Center's 14-member executive committee, none of whom are Latino. It's important to acknowledge that programming at the Kennedy Center is very diverse. Latinos are well-represented, too. Take it from pianist and bandleader Arturo O'Farrill, who heads up the Afro-Latin Jazz Alliance. "We've done Jazz Piano Christmas," he says. "I've been there with Ballet Hispanico, I've been there with Lincoln Center Orchestra, I've been there many, many times." O'Farrill says he's always been treated with respect by the Kennedy Center. But he believes the lack of Latinos in the institution's highest profile event is just plain bad math. "I think it's a slight. I think it's an oversight. And if people don't speak out against this kind of behavior, it will continue," he says. This is the first year that the call to recognize Latinos has gained momentum. The Congressional Hispanic Caucus asked to meet with Kennedy Center officials to discuss the oversight, and the center is examining the entire process. Leading the effort is Giselle Fernandez, a former TV journalist and executive in talent management for the Trump Group. President Obama appointed her to the Kennedy Center's Board of Trustees last year. She is the board's only Latino member, and she says change is coming. "Our focus has to be, 'What is the selection process?' " she says. "'How can it be more inclusive, how can it be representative of the great artistic contributions of this nation and carry on a legacy to this President Kennedy, who was so embracing of multiculturalism?' "
As to whom the Kennedy Center Honors might consider, Felix Sanchez and other Latino advocates have provided them with a list of potential honorees, including Joan Baez, Carlos Santana and Rita Moreno. Some big names in Washington, D.C. this week - I mean, even bigger than usual - Dustin Hoffman; David Letterman; Natalia Makarova, the ballerina; Buddy Guy, the Chicago blues guy; and Led Zeppelin, the British rock band - will all receive the annual Kennedy Center Honors, a prestigious award given to just a few performers each year. But over the past few months there's been controversy surrounding the Kennedy Center Honors. In its 35-year history, only two honorees have been Hispanic, despite the fact that Latinos are the largest minority in the United States. NPR's Elizabeth Blair reports. ELIZABETH BLAIR, BYLINE: The Kennedy Center Honors was founded by George Stevens, Jr., a Hollywood veteran and award-winning filmmaker who also co-founded the American Film Institute. On the Center's website, there's a video clip from that very first Honors ceremony in 1978. Conductor Leonard Bernstein explained what the Kennedy Center Honors would be about. BLAIR: Fred Astaire, Ella Fitzgerald, Mikhail Baryshnikov, Quincy Jones and Meryl Streep are among those who've received Kennedy Center Honors over the years. When they come to Washington, honorees are treated like royalty. There's a private State Department dinner. They sit next to the President and First Lady at a star-studded tribute. FELIX SANCHEZ: These awards have turned into a quasi-governmental national awards. BLAIR: Felix Sanchez is president of the National Hispanic Foundation for the Arts. For two years, he's been writing letters to Kennedy Center officials asking why out of a total of 186 artists and entertainers only two honorees have been Hispanic, Placido Domingo in 2000 and Chita Rivera in 2002. SANCHEZ: And when you paint that picture and you leave the Latino artist community out of it, there's a huge hole. BLAIR: Sanchez says there have been many deserving Latino artists over the years. SANCHEZ: You had Anthony Quinn, Celia Cruz, so many big vital names - Desi Arnaz - that represented the Latino community. BLAIR: According to the Kennedy Center's website, a national artists committee, including some former honorees, makes recommendations. There are 76 people on that committee. Only two are Latino. The final honorees are selected by the Kennedy Center's 14-member executive committee, none of whom are Latino. Now it's important to say that for the rest of the year, programming at the Kennedy Center is very diverse and Latinos are well represented. Take pianist and bandleader Arturo O'Farrill who heads up the Afro-Latin Jazz Alliance. ARTURO O'FARRILL: I've been there with Ballet Hispanico. I've been there with the Jazz Lincoln Center Orchestra. So, I've been there many, many times. BLAIR: Arturo O'Farrill says he's always been treated with respect by the Kennedy Center. But he believes the lack of Latinos in the institution's highest profile event is bad math. O'FARRILL: You know, I could easily be accused of shooting myself in the foot by coming on NPR and saying these things. But I think it's a slight. I think it's an oversight. I think it's time to change, and if people don't speak out against this kind of behavior it'll continue. That's just a fact. BLAIR: This year is the first year that the call to recognize Latinos has gained momentum. The Congressional Hispanic Caucus asked to meet with Kennedy Center officials to discuss the oversight. And the Center is examining the entire process. Leading the effort is Giselle Fernandez, a former TV journalist and executive in talent management for the Trump Group. President Obama appointed her to the Kennedy Center's Board of Trustees last year. She is the Board's only Latino member, but she says change is coming. GISELLE FERNANDEZ: Our focus has to be what is the selection process, how can it be more inclusive, how can it be representative of the great artistic contributions of this nation and completely carry on a legacy to President Kennedy, who was so embracing of multiculturalism. BLAIR: As for WHO the Kennedy Center Honors might consider, Felix Sanchez and other Latino advocates have provided them with a list that includes Joan Baez, Carlos Santana and Rita Moreno. BLAIR: Elizabeth Blair, NPR News, Washington. Transcript provided by NPR, Copyright NPR.